The rate at which iron corrodes in demineralised water in the presence of oxygen will be minimal. However, the slightest amount of salts dissolved will initiate corrosion and will do so in various ways. Overall mineralisation will increase water conductivity and, therefore, the corrosion current for a given potential (please refer to Icorr in kinetics of the corrosion reactions). Consequently, corrosion can be initiated by traces of chlorides or sulphates below 1 mg·L–1. Cℓ–, F–, Br–, SO42–, NO3– ions will stimulate corrosion. In the presence of these anions, overpotential levels are lower and steel dissolution requires less energy. Adsorption of these anions over anodic zones would make it easier for iron to migrate towards the interface: this adsorption would be much more significant with halides than with anions having the highest atomic weight and/or valency. Conversely, OH–, CrO42– and SiO32– ions tend to encourage the formation of a protective layer. Widely documented on stainless steel, chlorides also have a very strong effect on mild steel. This effect is caused by high concentrations of very mobile Cℓ– ions that are attracted to anodic zones where they combine to form HCℓ, while preventing any local precipitation of iron hydroxyde. The increased Cℓ– concentration in water increases the probability of pitting corrosion; however the effect caused by the synergy between Cℓ– ions and oxygen can be extremely serious. When there is absolutely no oxygen, the presence of chlorides may be negligible provided on carbonic non-aggressivity conditions in water are met. However, in the presence of oxygen, even in very small amounts, the differential aeration process comes into play and generates a corrosivity that rises rapidly with the increase in chloride content, even in carbonate equilibrium water. 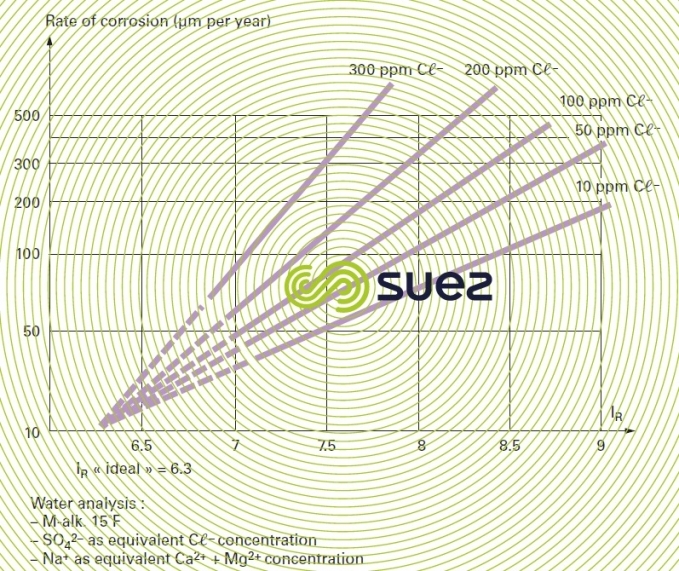 An experimental diagram links corrosion rate to chloride concentration and to the Ryznar index for aerated water (figure 9). through a specific concrete degradation process (see damage to concrete).